I've been feeling out of sorts lately for reasons I can't put a finger on, so I took a break to clear my head and decided to go check out the waves - one of those things I always say I really should do more often. It was cold for the beach and rain was threatening off in the distance, making an ominous purple sky at the horizon; but overhead, the clouds had a warm glow from the sun that occasionally peeked out. 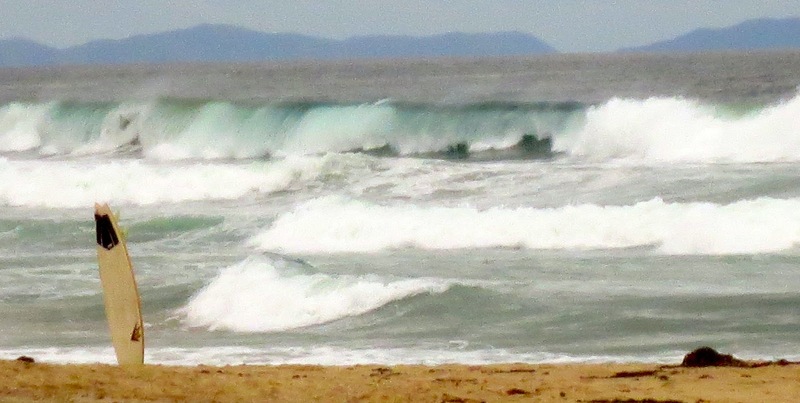 As often happens when a storm is near, the waves were especially big. And with the cold temperatures, there was hardly anyone at the beach except the surfers. They must love it when its their own private beach like that. And just like that, its football season again. MLS kicked off their new longer 2013 season this weekend, and suddenly all those 'things you meant to do during the offseason' just vanished. LA's home opener was Sunday, and in true LA fashion, that cool 61 degree forecast seemed a lot sunnier and hotter than they said. Not that that's anything to complain about - it sure beats a monsoon. Even though only its been a short couple months, the pregame tailgate was a great homecoming for everyone, but also had an awful lot of new faces. ACB kicked the game off with a massive tifo across the north end, and then was in full gear through the whole game. The team responded with a 4-0 rout of Chicago. Not a bad way to get things started.